Lydia Carranza was working in the office of a dentist in Beverly Hills, California when a gunman ran in and opened fire. He aimed the weapon directly at her heart but one of her silicone implants took the force of the blow, stopping bullet fragments from reaching her vital organs. The gunman had gone to the dental office looking for his wife, who also worked there. She was shot and killed in the attack. Mrs Carranza was sitting a few feet away when the gunman turned on her. "She's just one lucky woman," surgeon Dr Ashkan Ghavami told the reporters. "The bullet fragments were millimetres from her heart and her vital organs. Had she not had the implant, she might not be alive today." 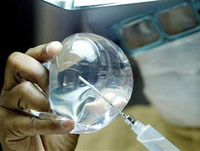 Mrs Carranza, a mother of three and grandmother of two, had implants some years ago to change from a B-cup to a D-cup. When the gun was pointed at her she "didn't look or think about it," she told the reporters. "I just felt wet in my chest area. I thought I was going to die." Jaime Paredes, the alleged gunman, is awaiting trial on charges including murder following the shooting in July. Telegraph co.uk. has contributed to the report.